But will supply meet the demand? Microsoft's Kinect for Xbox 360 has gone on sale, with the latest gaming peripheral already tipped by some major names to be the biggest seller this Christmas if supply can meet demand. The motion and sound sensor peripheral extends the now-mature Xbox 360 into a completely different beast, with Microsoft hoping that the prospect of playing games without a controller will push them ahead in the family gaming market. Neil Thompson, the UK's General Manager of Microsoft's Entertainment and Devices Division said: "We are delighted to put Kinect into people's living rooms and turn science fiction into science-fact. "Kinect transforms games and entertainment experiences, offering an intuitive and simple way that everyone will enjoy." Although the Kinect has earned some criticism for its launch titles, the technology itself has earned praise and the potential is far from being realised just yet. Best Buy – a company that has only recently made its entry to the UK market – is expecting 'brisk demand' but appears concerned that there will be a shortfall in units available to buy. Harry Parmar, Commercial Director at Best Buy UK, said: "Following the success of the Nintendo Wii, Sony Playstation 3 and its Move device, increasingly consumers are looking to gaming devices as a way to have fun with friends and family and to keep active. "We are preparing ourselves for brisk demand for the Kinect, especially with Christmas present-buying now on most people's minds. "Availability is very limited and on a first-come, first-served basis, but we expect deliveries between now and Christmas." TechRadar's Xbox Kinect review awarded the device 3.5 stars, praising the way in which it made the Xbox 360 a well-rounded device. 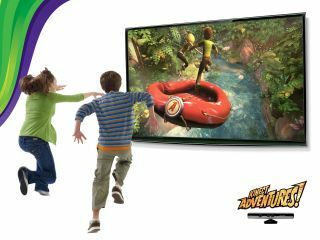 You can also find out what games are available for Kinectas it launches in then UK, including Kinectimals and Dance Central.